Kawanabe Aiki-Budo is based on traditional Japanese martial arts encompassing hachiriki concepts, aiki-jujutsu, karate and hachi-ken. Soke Kawanabe Kenjiro, 87 years young, 10thDan Funakoshi-ryu (Shotokai) Karate-Do, Shin’ei Taido and founder of Hachiriki-ryu Karate-Do, is one of the last great grandmasters who studied directly, and was senior student, under the father of modern karate and Shotokan-ryu Karate’s founder, Funakoshi Gichin Sensei. Soke Kawanabe also studied extensively under Inoue Hoken Sensei, master of Daito-Ryu Aiki-jujutsu, co-founder of Aiki-Budo and Aikido with his uncle, Morihei Ueshiba, and the founder of Shin’ei Taido; Okuyama Tadao Sensei, noted Shotokan-ryu master and author of the Kotodama Tsurugi, a treatise based on the Hachiriki [eight powers or forces]); and Okuyama Ryuho Sensei, master of Daito-Ryu aiki no jutsu and founder of Hakko-ryu jujutsu. 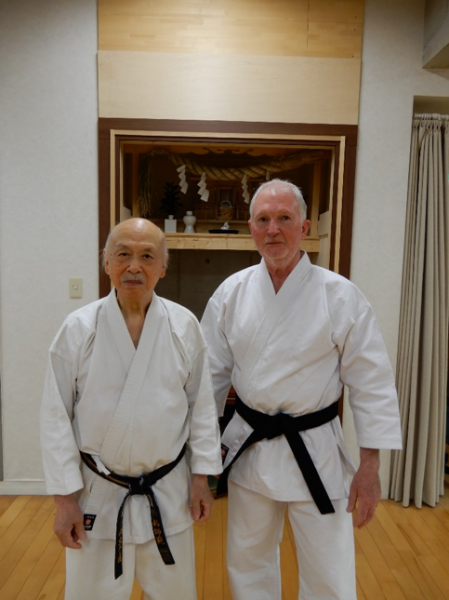 Hanshi Laurie Gray, Kawanabe Sensei’s Australian representative and Saiko Shihan for Kawanabe Budo Australia, recently celebrated his 51styear as a martial artist. He is graded to 8thDan in Shotokan-ryu (ShotoKai) Karate-Do, 2ndDan in Goju-Kai Karate-Do, and 2ndDan in aiki-jujutsu, which he has studied for the past 25 years. He travels to Japan on an annual basis to train one-on-one with Kawanabe Sensei at the Kawanabe Budokan in Tokyo.